Sandra Jo Horne obituary. Carnes Funeral Home. 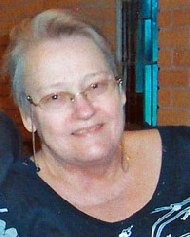 Sandra Jo Horne, 67, of Texas City, Texas passed away in her home on May 19th, 2014. Sandra was born in Texas City, TX on February 10th, 1947 to Eugene and Dorthea Adams. She worked for American National & Prudential Insurance Companies and finished her career as the office manager at South Shore Medical Center before retiring in 2011. In addition to her husband Harry, Sandra is survived by two daughters, Jennifer, age 30, and Andrea, age 29; four grandchildren, Alexis, age 10, Kavon, age 6, D’Laney and Tiana both age 4. A Memorial Visitation to remember Sandy will be held on Monday May 26th, 2014 from 10:00am to 1:00pm at Carnes Funeral Home - Texas City, 3100 Gulf Freeway Texas City, TX 77591. Please feel free to come anytime between 10 and 1pm. In lieu of flowers, you may send donations to Amed Hospice in Texas City, TX or any cancer research foundation.